As a region faced with rapid acceleration in urbanization, investment in Smart City information and communication technology (ICT) in Asia Pacific alone will total US$63.4 billion from 2014 to 2023. Understanding the need to provide Smarter solutions for the earth declining sustainability towards the rising number in the world population, Fleming. 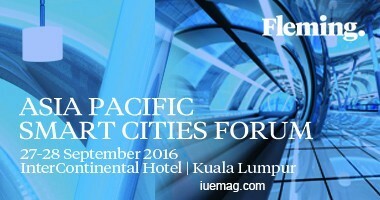 is organizing the Asia Pacific Smart Cities Forum from the 27th to 28th September 2016 in Kuala Lumpur. The forthcoming forum will deliberate on providing Smarter Solutions for building cities of the future, today. The forum will be inaugurated by The Honorable YB Datuk Seri Panglima Madius Tangau, Minister of Science, Technology & Innovation Malaysia. At this platform, industry leaders, market players, ministries and corporate executives will come together to recognize innovative projects, paving the way towards the smart cities of the future. The two-day event will comprise of exciting perspectives and insights from renowned local and international experts. With more than 20 speakers, the forum will become a place for proven strategies, cutting-edge technologies and knowledge transfer. The forum will focus on the following topics: sustainability & the green buildings framework, regulatory & policy framework for Smart Cities as well as data protection and privacy, including many more other key focus areas in Smart technologies and solutions. Among the speakers are experts from the Greater China Sustainable Development Council, Tenaga Nasional Berhad, Penang State Government, Amsterdam Smart City, New Zealand Transport Agency, Barcelona City Council and many more. "Why do we need Smart Cities?, and why are we organizing this conference? There are three aspects that can answer these questions right away; economic growth, urbanization and environmental challenges. Asia Pacific is considered to be a prominent emerging region in realizing the Smart Cities concept. As population increases, so will urbanization and this will create a necessity to develop Smart and sustainable solutions within cities." quoted Silvester Pullman, Managing Director at Fleming. In addition, the Asia Pacific Smart Cities Forum will feature three case studies; Penang integrated transport system framework, Amsterdam Smart City and Toyota city. Furthermore, there will be two concurrent streams happening on the second day of the event conferring on industry development and Smart technology. Fleming. connects great people, useful know-how and valuable opportunities. With 12 years in the business and 300+ events organized annually, Fleming. has grown to offer a portfolio of Conferences, Trainings, Exhibitions, Blended Learning and Online Conferences. Present on five continents Fleming. has partnerships to always stay one step ahead. More than 50,000 satisfied companies participating at our events every year prove that Fleming. is the right partner. The company works from a network of offices in Bratislava, Budapest, Dubai, Chicago, Kuala Lumpur, Nairobi, Jamaica, Pune and Bangalore. Nowadays, around 600 employees, powered by experience, skills and creativity from more than 50 nationalities work for Fleming.